Exploring the outback ochre terrain aboard Trillion, Pixie, Dock, Ruby, Saleh, Anna and Odin from Pyndan Camel Tracks, south west of Alice Springs. 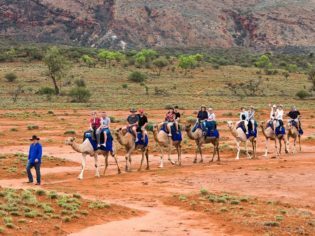 Megan Arkinstall relives a childhood fascination, a vivid memory of the outback’s red dirt, but this time on the back of a camel, somewhere south west of Alice Springs. The only other time I remember seeing dirt this red was during a trip to the back o’ Bourke, where my mother was born and bred, more than 15 years ago. I was absolutely fascinated by it, so much so that I scooped some of it up in a film canister (remember those?) and took it home. I still have it in my box of special and very random things that I’ve collected over the years. Now, at almost at 30, I have finally returned to the outback – on board the Ghan, no less – and am still as fascinated by this deep red dirt that the heart of our country has in droves. In fact, I am fascinated by the outback in general: the colours, the history, the people, the wildlife, the towns, the absolute isolation. And here I am in Alice Springs, the centre of it all. More than just the gateway to Uluru, Alice is a town of extraordinary character, shaped by its history and people. The town has been a part of extraordinary infrastructure projects, such as the Overland Telegraph between Darwin and Adelaide and the original rail link from Port Augusta to Alice Springs, saw a boom in 1887 when gold was discovered in nearby Arltunga, was a major army supply depot during WWII, an integral base for the Royal Flying Doctor Service, and has been the stage for some of the country’s most successful indigenous rights campaigning. On board the train journey to Alice, I got stuck into reading about the huge role the train’s namesake, the Afghan cameleers, had on the transportation of goods through our country’s inhospitable interior by way of camel. And, although Alice was the last place camels were settled in this country, they too have forged their place in the town’s history, being used to transport goods here from Oodnadatta and as part of the Overland Telegraph and major rail links. So, although I wasn’t about to pack up life and mimic a transcontinental trip like that one – and with only a short stop in this glorious town as part of the Ghan journey – a camel ride with Pyndan Camel Tracks seemed fitting. Owner Marcus Williams, who greets us with a soothing “G’day” and a friendly grin from beneath his Akubra, caught his first herd of camels from Todd River Downs Station, just south of Alice, in 1994. Pyndan Camel Tracks’ Ruby shares a tender moment. “An old fellow out there pointed towards the Simpson Desert and told me to look for the camel tracks,” he explains. It took him three weeks of training in a desert camp before he could walk them back to Alice Springs where he set up Pyndan Camel Tracks. Two of these once-were-wild camels, Trillion and Anna, are still part of his 10-strong herd. These two ladies are also part of our ‘camel train’, along with Pixie, Dock, Ruby, Saleh and Odin, who is trailing at the back. Each camel has its own distinct personality. Odin is described as being a little knock kneed, a bit dopey and pretty much blind, but a dependable anchor at the end of the line. I’m always rooting for the underdog, so Odin steals my heart. AT’s Megan gets to know her soon to be steed Saleh; Pyndan Camel Tracks, Alice Springs. As does my noble stead, Saleh who was bought “from a camel fella” in 2009 and is, apparently, the most faithful of them all. He doesn’t like being spoken to harshly – who could do that? – and was incredibly shy at first. After a not so graceful mount (it’s a little tricky, but not as tricky as dismounting), my riding buddy and I are sitting high on board Saleh. Camels are magnificent creatures in manner and size: they can grow to be 2.3 metres tall and a whopping 690 kilograms. We are led into the neighbouring White Gums Station, following a track lined with mulga trees and iron bark, across clay pan flat and passing a herd of cows who stare as we meander on by. The station is surrounded by the majestic and ancient MacDonnell Ranges, offering the most spectacular setting with a colour palette of sage green and gorgeous ochre red. Anna from Pyndan Camel Tracks, south west of Alice springs, hams it up for the camera. It’s incredibly quiet and peaceful (apart from Odin who occasionally bellows for his mother, Anna, just ahead of him on the camel train) as the sun sets a warm glow over the ranges. We stop so that our guide, who juggles iPhones among SLRs, can get the token tourist shot for us. Who can pass up the opportunity to capture this quintessential Aussie scene – a camel train in the desert, with the MacDonnell Ranges in the background? As we are posing Anna – who was named after Marcus’s friend ‘No-Tooth Anna’ because she, too, has lost a tooth – cheekily comes up behind me and gives me a big sloppy kiss on my leg. Yes, these camels know how to make an impression. Get the camera out, dirt doesn’t get any redder than this: Pyndan Camel Tracks, south west of Alice Springs, NT. Back at the camp, suitably sweaty and a little bit stinky, we sit in the ‘camel lounge’ – where there is some interesting camel memorabilia depicting their history in Australia and Alice – and enjoy a frosty beer, a welcome refreshment in the stifling heat and the perfect end to this Alice experience. Oh, don’t forget your film canister when you come out this way.